Uzun, T. (2014). General tendencies of English language learners in using an independent learning centre within the Turkish higher education context. Studies in Self-Access Learning Journal, 5(2), 98-111. Independent Learning Centres (Self-Access Centres) have become an essential component in language teaching institutions to aid learning and foster autonomous learning behaviour. To reach these goals, it is vital to ‘listen to the people’ in the target group. The efforts made and services offered need to be analysed systematically in each centre and centres should be organised and administered by taking students’ needs and expectations into consideration. The main aim of this study is to put forth a profile of how an Independent Learning Centre (ILC) is used by English preparatory class students (n=715) in higher education in Turkey. The overall numbers concerning the ILC use, purposes of regular users in visiting the centre, reasons of non-users, materials they find most useful and their needs and suggestions related to the centre have been analysed. The most common purpose for using the centre was found to be ‘to do homework’. According to the users, ‘listening materials’ are the most useful type of resources. ‘More study space’, ‘more listening materials’ and ‘more guidance’ were the most notable needs of the students in the centre. Based on the findings and understanding of the field, suggestions are given to improve the services and materials within the centre. Learner-centredness as a perspective involves the roles of teachers and learners within various learning and teaching contexts. The idea itself could basically refer to in-class instruction, which is normally directed by teachers. However, instruction becomes ‘learner-centred’ if pedagogic decisions are made by the teacher with the idiosyncratic interests and needs of each group of learners (even each individual member) given top priority (Johnson & Johnson, 1999). Studying within learner-oriented teaching environments is usually a challenge for students because, as suggested by Sachs (2012), they are used to being led by teachers and when they are given the possibility to choose their own way, pace or method, they feel insecure and show no interest. According to Harmer (2007), no matter how good a teacher may be, students will find it difficult to learn a language unless they aim to learn outside, as well as during, class time. It is clear that language learning requires time, energy, guidance and in some cases financial support, particularly in terms of tutoring and reaching resources. Teachers might feel the need to assist their students in covering some of these needs; however, a more institutionalized and professional approach to this matter seems more appropriate. In this sense, centres, commonly referred to as Self-Access Centres (SACs), Independent Learning Centres (ILCs) or Language Learning Centres (LLCs), are useful tools generally utilised in language teaching institutions to assist learners in language learning processes. These names are generally used interchangeably. A self-access centre can be broadly defined as a purpose-designed facility in which learning resources such as audio, video and computer workstations, audiotapes, videotapes and DVDs, computer software and print materials, access to the internet or satellite TV are made directly available to learners (Benson, 2011). No matter how they are named (SAC, ILC or LLC), all these centres have similar ultimate goals – to help students maximise their learning opportunities and to foster autonomous learning (Dofs & Hobbs, 2011). Such centres are regarded as a useful adjunct to classroom learning – or indeed an alternative to it (Harmer, 2007). In terms of the services and resources provided today, Gardner (2007) points to the blurring boundaries of self-access centres as they attempt to do the tasks such as maintaining both physical and virtual locations for learning, providing materials, technology and activities, offering learners advice, guidance, help and support, integrating with a world-wide web of learning resources and integrating with locally-taught courses. In an institution where a similar centre has been established, it is of great importance to evaluate its efficiency; however, as suggested by Morrison (2011), there is no research-based framework specifically developed for these centres’ evaluation and it is a serious concern as frameworks designed for other educational entities are not necessarily appropriate for this purpose. In terms of evaluation, analysing the learning tendencies, needs and suggestions of users could be considered as one option. Surely, these centres are quite dynamic and materials and services need to be improved and updated; however, as a learner and learning oriented body, such efforts for development can be more successful if the needs and voices of the learners targeted are taken into consideration. In order to take new steps further, every institution needs to have a clear picture of the situation within its own boundaries. In Turkey, these centres are generally found in foreign language teaching institutions of universities. Some centres are formed to enable learners to carry out more paper-based studies while others provide learners with computer and internet-based study options. The types of study activities offered in such centres are not standardized and no framework or governmental policy has been reached during the research concerning the formation of these learner-oriented bodies and their evaluation within the Turkish higher education context. It is generally observed that every institution, either state-oriented or private, follows its own path. Therefore, analyses concerning the effectiveness of services and resources in such a centre through students’ opinions will have to be structured specifically for each centre. This study aims to present the overall tendencies of English preparatory class students in using an independent learning centre at a state university in Turkey. The study was conducted at Yıldırım Beyazıt University, a state-oriented university located in Ankara, Turkey. The university was founded in 2010. The university’s School of Foreign Languages served more than 1000 students with approximately 70 instructors in the 2012-2013 academic year. The only foreign language currently taught is English. Students receive 20-25 hours of English classes per week depending on their levels and have to complete the programme requirements successfully so as to start their academic studies in their departments. As the medium of instruction is 100% in English in many departments, preparatory classes are compulsory for most of the students. An Independent Learning Centre (ILC) operates within the School of Foreign Languages. The ILC located at the university is made up of two connected rooms with 20 computers in each and a library section in the middle. There are also tables and chairs in each room for personal studies without computers. The centre contains various printed materials, such as course books, dictionaries, readers and supplementary materials in its library section. Besides these, there are 40 computers placed in the centre for the use of students. The module ‘ILC’ on the desktop of every computer enables students to reach the uploaded computer-based study materials, which are made available for every user separately. 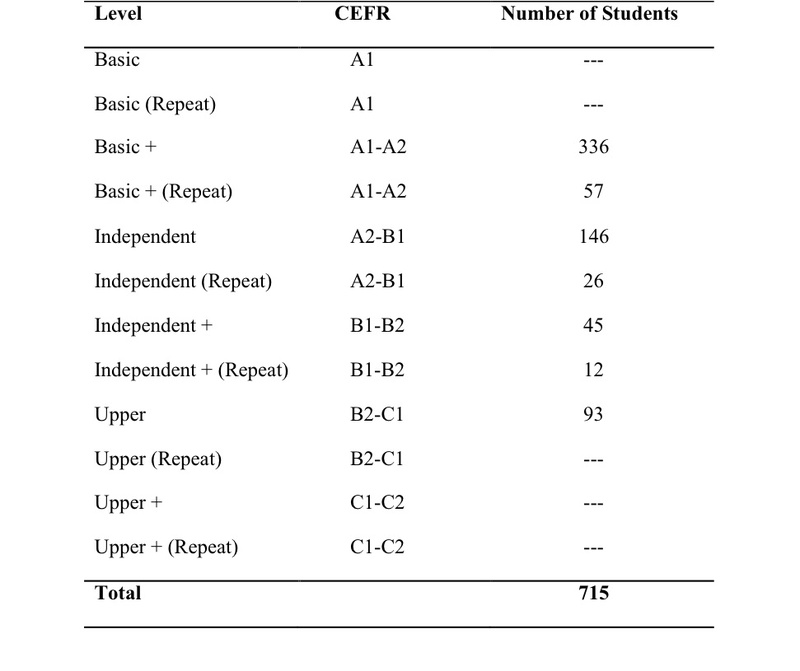 Students are expected to study independently by selecting an appropriate level from A1 to C2, based on the Common European Framework, and carry out free practice for as long as they want. The users of the centre can also do listening practice with headphones. Students are not required to attend the centre, and the English language curriculum is not integrated directly with the content of the resources offered in the ILC. Attendance is optional, but students are encouraged to visit the centre. Students are assisted immediately if they face any technical difficulties or ask for printed, computer or internet-based resources. The centre is operated by a general coordinator, instructors and part-time students, who are appointed to work there. Students can find speaking, listening, reading, writing, grammar, professional English, vocabulary development and pronunciation materials in the ILC module on each computer. Besides these, a free internet connection and web links for individual study, preparation materials for international language exams and resources for various course books are also made available. Participants of this research were preparatory class students who were studying English at different levels within the compulsory one-year programme during the 2012-2013 academic year (See Appendix A). These students were to fulfil the program requirements in order to complete this preparatory class successfully and start their undergraduate studies. Upon completion of these requirements, the students would then join various faculties such as Medicine, Humanities and Social Sciences, Engineering, Political Sciences and Law. The research aimed to include all of the preparatory class students, and 71.1% of them (715 out of 1005) participated in the study. A questionnaire was used to collect data in this study. In order to reach as many students as possible and analyse their overall learning tendencies within the ILC context, the use of a questionnaire was considered the most useful and practical method. As pointed out by Wray and Bloomer (2006), questionnaires can be used to collect both qualitative and quantitative data, and are suitable for a range of research questions allowing data to be collected from a number of informants. It was anticipated at the beginning of the research that the results would give a clear picture of the ILC use at school. The questionnaire was taken into all the classes at school and those students who were present were asked to complete it during the class time. Students who were absent that day were not included in the sample. Analyses were carried out by calculating the percentage for each item. Students were also given the chance to share their own thoughts within some of the questions by choosing the option ‘other’. 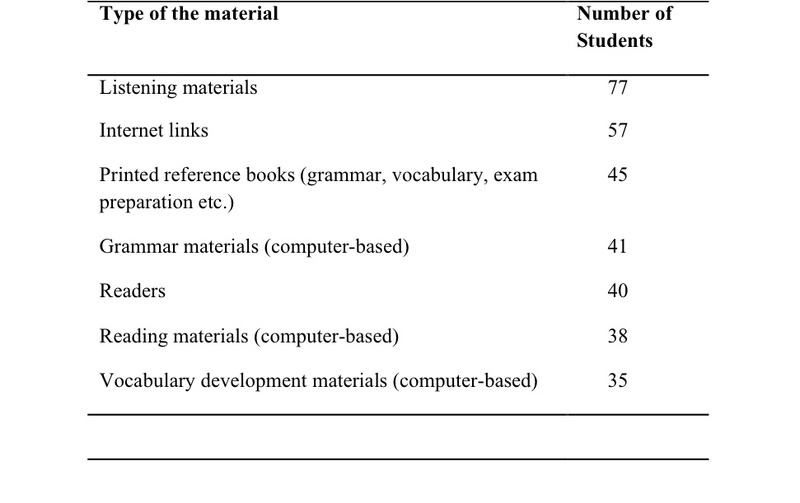 Other comments offered by students in each question were also analysed in percentages and some of these found worth considering were cited below each table. The first question played an important role as it determined the subsequent questions that students would answer. Non-users who selected the option “I have never used the centre” were asked to choose a reason out of the given ones or add their own into the given blank. Their reasons have also been analysed within the study. Those who declared that they use the centre once or twice a week, three or four times a week and at least five times a week were labelled as regular users of the centre. In total, 328 female/45.87% and 387 male/54.13% students completed the questionnaire. The number of male non-users was 158 (55.3%), and the number of female users was 128 (44.7%). Considering the regular users of the centre, there was a slight imbalance as the regular male users of the centre made up 59.7% (86 users) of the total users while regular female users constituted 40.3% (58 users). The data obtained in the study show that the number of non-users is quite high and similar to the students who used the centre only once or twice. The number of those who attend the centre regularly was found to be 144 out of 715. The detailed numbers are given in Table 1. Reasons that non-users (286 students) gave for not using the centre reveal some interesting results. The respondents could give more than one reason, and the most common reasons were found to be “I find my resources sufficient” (101 students) and “I don’t like studying on a computer” (58 students). Students’ choices in computer-oriented language studies need to be subjected to further in-depth research as this study did not focus on technology integration into an independent learning centre and how students perceive it. Table 2 shows the students’ reasons for not visiting the centre. The ‘other’ reasons suggested by some non-users were categorized, and the two most common ones are shown as follows in Table 3. Regular users (n=144) were asked to give their reasons for visiting the centre. (They could give more than one response.) They indicated that “doing homework” was their most significant reason for visiting the centre. The main reason for this result seems to be the free internet connection offered as students are expected to use their online homework modules of each course book. Students’ effort in doing online homework is graded, and they receive 8 points upon fully and successfully completing the tasks assigned per level, which seemingly encourages them to follow their online homework more closely using the computers within the ILC. The purpose with the second highest score was found to be “to improve their English”, which can be considered a sign of awareness in their belief that the ILC could be a useful tool to help improve their language skills. Regular users’ purposes/reasons for visiting the centre are shown in Table 4. Regular users’ answers reveal that some materials in the centre are more popular than others. As a study area allowing computer and internet-based studies, the centre clearly has some advantages compared to other self-access/independent learning centres without any technology integration. Free listening materials organized according to students’ levels and internet links for online study were found to be the most useful resources for the students. These resources can only be accessed in the centre; however, plans are underway to make these resources available for distance access in the future. The seven most useful types of resources, according to the students, are given in Table 5. As shown in Table 6, regular users of the ILC point to some of their needs and suggestions inside the centre. Students’ answers indicate that the physical capacity of the centre is sometimes insufficient. The most common suggestion was to create “more study space”. In addition, students underlined their high expectations for listening studies by asking for “more listening materials”. Results indicate that listening resources need to be increased although students find listening materials the most useful type of resources. Thirdly, the number of students in need of guidance was high, as 49 students demanded “more guidance”. This result implies that students do not regard the centre only as a resource centre, but they also expect it to offer services to foster learning opportunities. It should be noted that, at the time of data collection, the centre did not offer professional guidance. However, towards the end of the term a guidance service was started for students. The guidance service was carried out by the teachers appointed to the centre. Students could have a face-to-face talk with the teachers and get advice about various ways to enhance their learning and exam performance. However, there is no data concerning how successful these efforts have been. 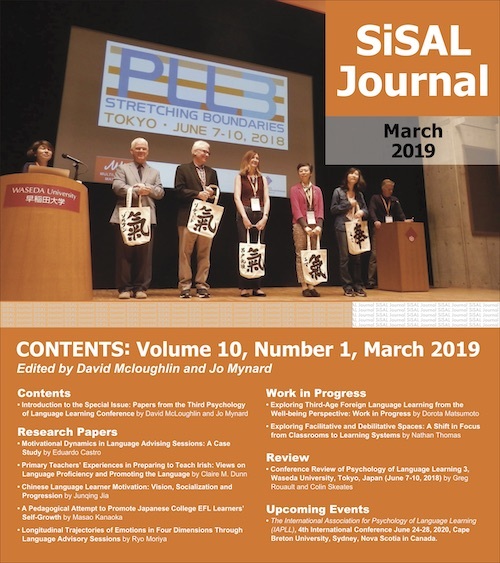 This study was designed to take a detailed picture of the visitors’ overall learning tendencies within an Independent Learning Centre context in Turkish Higher Education. However, based on the findings and analyses of this research, it is necessary to go farther in order to draw conclusions and suggest possible ways to overcome the difficulties witnessed. Before moving on to the conclusions and suggestions, it is necessary to mention the limitations of the study. Firstly, the data collected for this study belong to the 2012-2013 academic year, when the students and policies of the ILC were different in some ways from the ones today. This should be considered as a limitation, and the results need to be studied within the given conditions at the time of data collection. Another limitation was that the questionnaire was not piloted because of time restrictions (the end of the term was getting closer and the rate of absence was expected to increase). However, no negative feedback, failure in understanding the items or ambiguities was reported while the students were answering the questionnaires. The final limitation is that students did not seem to be aware of what would actually be needed to improve the ILC. This could be regarded as natural since the centre did not intend to offer students services different from the printed and computer-based resources when the study was carried out. The results of this study indicate that students did not use the centre located at Yıldırım Beyazıt University satisfactorily. In order to overcome this problem, students are now provided with services and activities, such as extracurricular skill-based activities, workshops, and student clubs. A guidance service is also being designed to assist learners throughout their learning. These efforts could in turn not only provide students with possibilities to improve their performance in the target language, but also teach them directly or indirectly how they could learn the best ways to be successful independent learners. It could also be expected that more students will be reached with these attempts, and the centre will become a more frequently visited facility at school. Introductory tours to the centre could also be organized. These tours seem to be necessary to make sure that the materials and services meet students’ needs and to both draw their attention and encourage them to visit the centre more often. During the ILC tours held in the 2013-2014 academic year, many students found the centre attractive and lively compared with their own classrooms (as observed by centre administrators and instructors). They frequently reported that they liked the computerised laboratories and asked their teachers whether it was possible to have their lessons in the ILC. This feedback shows that classes might have their lessons inside the centre at least from time to time depending on availability. 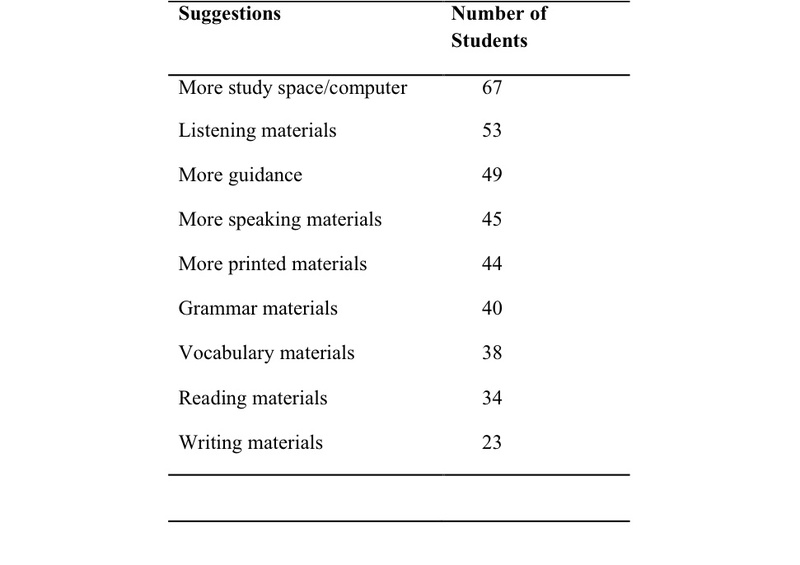 As a computer-based learning centre, the possibility of doing listening practice in the centre is quite important for students (see Tables 5 and 6). They seem to be aware of this possibility; nevertheless, listening materials need to be updated and enriched regularly. It is also being planned to move the ILC materials online and make them available for distance access. The necessity of this aim is supported with the common feedback received from students in the centre today. It can be expected that reaching the content online or on mobile devices would increase student access to learning tools. Language teaching institutions need to carry out similar surveys with their students and ‘listen to them’ repeatedly. Otherwise, the effectiveness of their efforts will not be easily evaluated. By doing so, new and more confident steps might be taken towards the goal of a better-organized and more fruitful learning environment. Tarik Uzun is an Instructor of English and Coordinator of the Independent Learning Centre at Yıldırım Beyazıt University School of Foreign Languages in Ankara Turkey. He has been teaching English and Turkish (as a foreign language) for 9 years. He is currently a PhD candidate at Ankara University Department of Linguistics Foreign Language Education Programme. His research interests are learner autonomy, self-access learning, phonetics, lexicology and Turkish language teaching. Harmer, J. (2007). The practice of English language teaching (4th ed.). Essex, UK: Pearson Longman. Johnson, K., & Johnson, H. (1999). (Eds.). Encyclopedic dictionary of applied linguistics. Oxford, UK: Blackwell Publishers. Sachs, K. (2012). Developing self-directed learning. IATEFL Voices, 226, 4-5. Wray, A., & Bloomer, A. (2006). Projects in linguistics: A practical guide to researching language. New York, NY: Hodder Arnold.